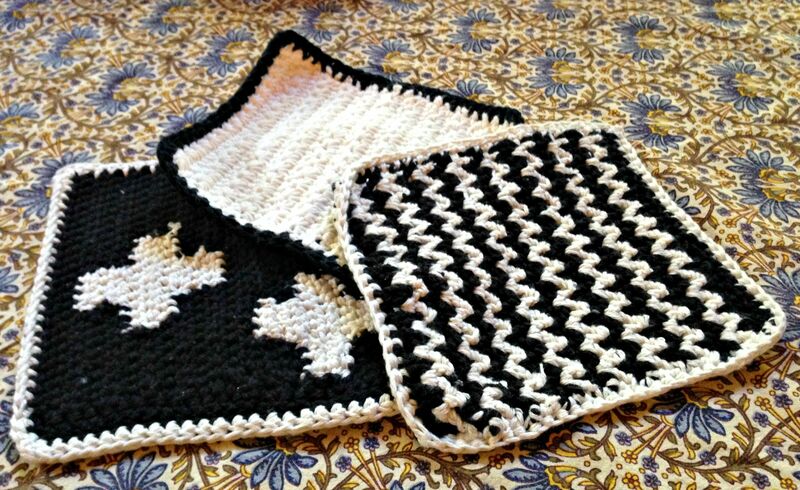 The last black and white washcloth I made used a star stitch. I really love the detail of this stitch, but I don’t think I was able to capture it as well as I wanted in the pictures. First, chain 33 (the same number I chained in the V stitch and Cross pattern washcloths). 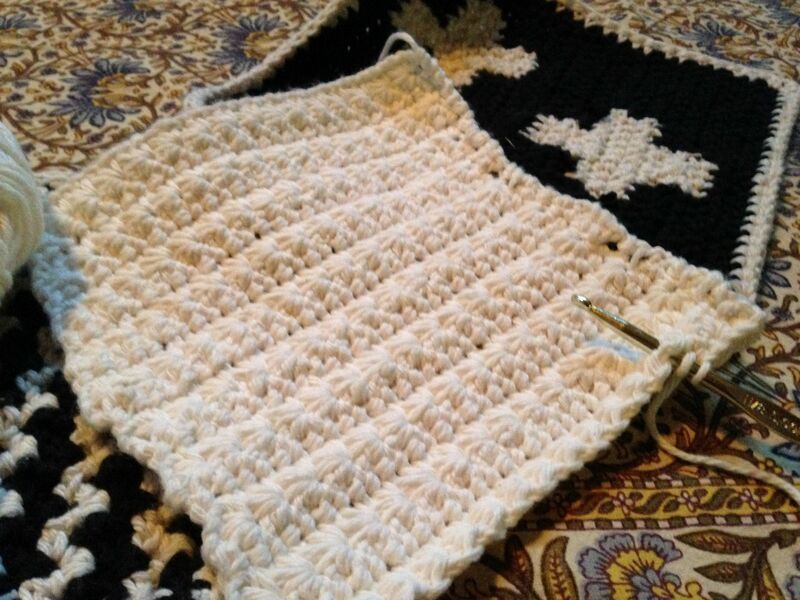 Insert your hook into the second chain from the hook and pull the yarn through (draw through). You should have two loops on your hook. Then, insert your hook into the next chain and draw through. Now, you should have three loops on your hook. Continue this for the next four chains and you have six loops on your hook. Then, yarn over and pull the yarn through all six loops and chain one. Next, insert your hook into the space created by the chain one (the eye of the star) and draw through, insert your hook into the last stitch on the star and draw through. Insert your hook into the next chain after the star stitch and draw through. Draw through the next two chains. You should have 6 loops on your hook. Yarn over and pull through all six chains and chain one. Repeat #3 until you reach the end of your chain. In the remaining chain, do one half double crochet. Chain one and turn your work. Single crochet one into the half double crochet you just did. Then single crochet into the first eye of the star. For the rest of the eyes across single crochet two into each until you reach the end of the row. Then, chain one and turn your work. Repeat step 2, only into the single crochet stitches instead of chains. Repeat step 3 until the end of the row. 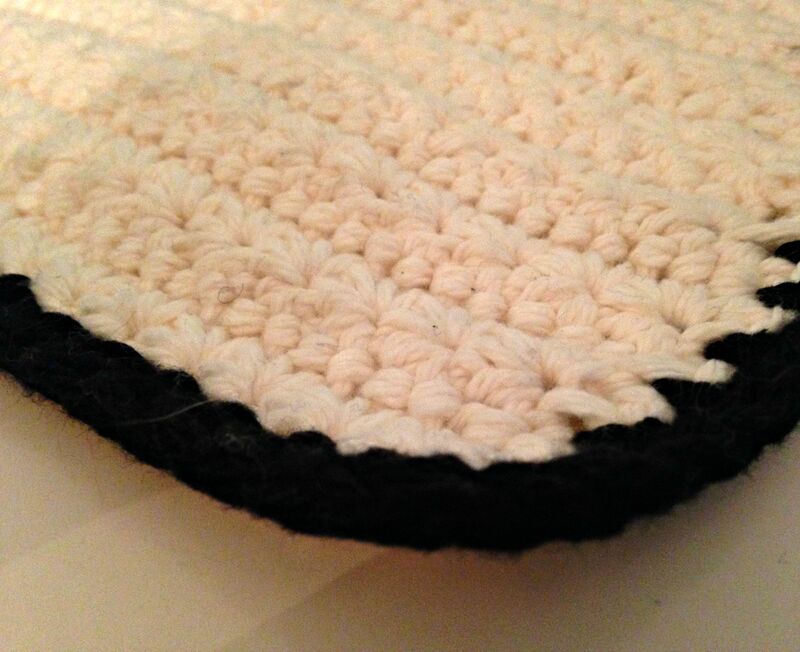 Continue with steps 2-3 until you have reached the desired length of your washcloth. 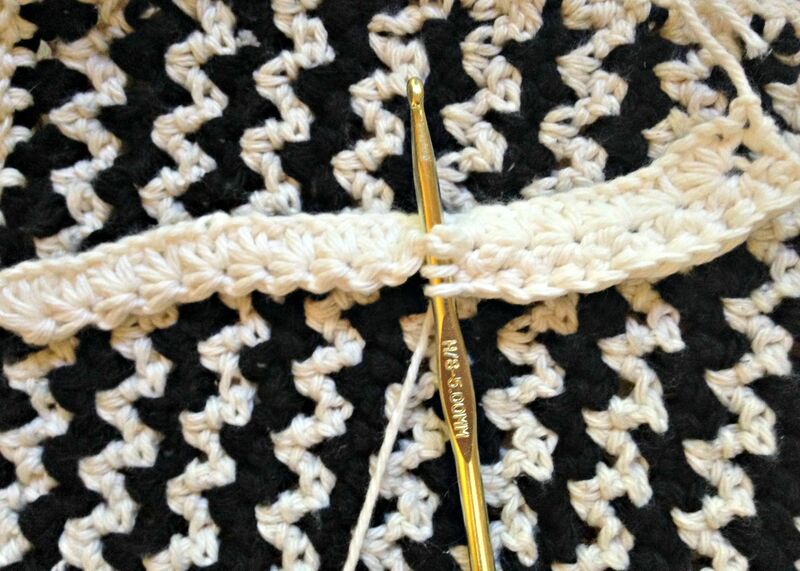 For more details on how to crochet a star stitch see this tutorial. Once you have reached your desired length for the washcloth, cut your main color and tie off. Then, switch colors to your border color. Half double crochet all the way around the washcloth, doing four stitches into each of the corners. Then, slip stitch the first and last stitches together, cut and tie off. And now you have a great washcloth collection! I am not sure which one is my favorite, but I definitely love the detail of the star stitch.